Which got more cover on BBC News website this week – terror or ketchup? On the evening of August 26th an incident took place near the Damascus Gate in Jerusalem in which a Border Policemen was wounded by a Palestinian attacker who stabbed him in the leg. The Israeli Police described the attacker as a 56 year-old man from Hebron, adding that he was carrying a knife and an axe. Like the majority of attacks against Israelis, this one did not receive any BBC coverage. However, the attacker was later identified as being Muamar Atta Mahmoud – the convicted murderer of Professor Menachem Stern – who was released from prison in December 2013 within the framework of the ‘goodwill gestures’ supposed to advance talks between Israel and the PLO in 2013/14. 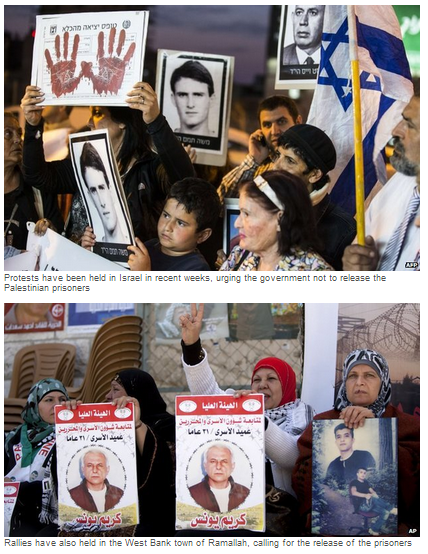 BBC coverage of those prisoner releases at the time made much of the terrorists’ status as “heroes of the Palestinian cause” and repeatedly promoted the description of them as “freedom fighters” and “political prisoners” whilst failing to adequately address the topic of glorification of terrorism – made especially relevant by the Palestinian Authority’s lavish receptions for convicted murderers. Nevertheless, the BBC has still not found it appropriate to inform its audiences of this incident. On the other hand, visitors to the BBC News website’s Middle East page did learn this week that Heinz can no longer label its product ketchup in Israel. Back on April 1st the BBC published an article on its website’s Middle East page titled “Premature to write off Middle East peace talks – Kerry” which we previously discussed here. In other words, BBC audiences were encouraged to believe that Mahmoud Abbas’ signing of those applications was a reaction to the delay in the release of the fourth tranche of prisoners on March 29th. However, on March 9th 2014 – almost a month earlier and a week prior to Abbas’ meeting with the US president at the White House – the PLO’s chief negotiator Saeb Erekat presented a 65-page document to Abbas outlining his proposals for the PA’s strategy for handling the final two months of the duration of the talks, which were set to conclude on April 29th. In other words, the recommendation to apply to join international conventions had been made long before the delay in the fourth tranche of prisoner releases. To avoid acts of accession to international institutions during the period of negotiations (nine months). Notably too, the Hamas-Fatah reconciliation deal (which was presented to audiences by the BBC’s Middle East editor as being the fruit of frustration with the talks) is also set out in Erekat’s document as preconceived strategy. In light of the fact that the BBC has framed the issue of the end of this latest round of negotiations as attributable to the Israeli prime minister alone, it would of course be appropriate for the corporation to inform its audiences of what in fact was going on behind the Palestinian scenes during those last two months of those talks. Should it fail to do so, the BBC would clearly be in breach of its public purpose remit to “build a global understanding of international issues”. Another day: another BBC article on the subject of the stalled talks between Israel and the PLO which does little to inform BBC audiences of the complete background to the current impasse. Having covered the subject in five previous reports published throughout the ten days between March 26th and April 4th (see related articles below), the BBC News website published an additional report on April 6th titled “Netanyahu: Israel will answer Palestinian unilateralism“. Based on remarks made by Israel’s prime minister at the weekly cabinet meeting on the same day, the report has little to contribute to audience understanding of the topic. Like its predecessors, this article fails to fully inform audiences of the background to the story, preferring instead to once again present an equivocally framed picture of events. “Earlier this week, Israel cancelled plans to free hundreds of Palestinian prisoners, arguing that Mr Abbas’s decision to sign up to several international conventions at the UN had violated the conditions for the release. In fact, twenty-six releases – not “hundreds” – were scheduled for the end of March (dependent upon progress in the talks – of which there was little), with 78 prisoners having already been freed in the previous three tranches under the terms of the agreement which preceded the return to negotiations. That offer was however rendered irrelevant by the Palestinian president’s live televised signing of applications to join assorted UN agencies on the afternoon of the same day – in violation of the July 2013 agreement which preceded the recommencement of negotiations, in which the PA committed to not applying to the UN throughout the period of talks scheduled to close on April 29th. The BBC’s failure to clarify to audiences that Abbas’ signing of the UN applications did indeed violate the terms of the agreement reached before the talks recommenced – and its framing of that issue as an Israeli claim alone – is clearly as misleading to BBC audiences as its gross inflation of the number of prisoners scheduled for release. The latter point has meanwhile been corrected following a complaint made to the BBC News website’s Middle East desk by a reader, to which the following response was received. “Earlier this week, Israel cancelled plans to free a final batch of Palestinian prisoners, arguing that Mr Abbas’s decision to sign up to several international conventions at the UN had violated the conditions for the release. The Palestinians however say that Israel had already reneged on a commitment to free the prisoners. A footnote was appended to the report. One does have to wonder how such an obvious factual inaccuracy managed to slip past fact checking and editorial processes. 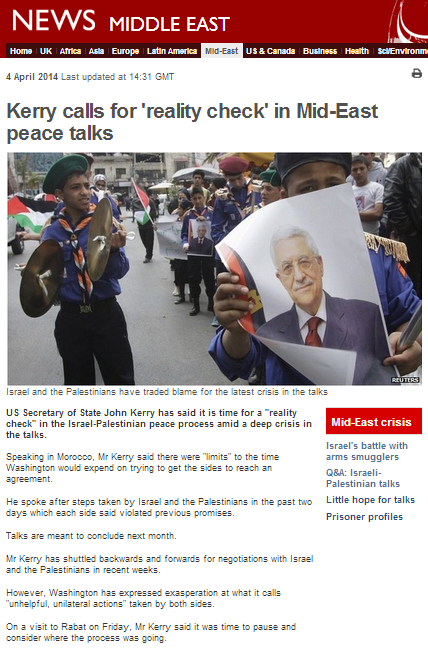 On April 4th a report appeared on the Middle East page of the BBC News website under the title “Kerry calls for ‘reality check’ in Mid-East peace talks“. Based on remarks made by the US Secretary of State during a visit to Morocco, the article makes repeat use of the theme of equivalence promoted in previous recent coverage of the floundering talks between Israel and the PLO (see ‘related articles’ below) and is blighted by the same omission of crucial information which compromises audience understanding of the events which led to the current crisis. “Israel and the Palestinians have traded blame for the latest crisis in the talks”. In short, rather than fulfilling its role of building “a global understanding of international issues”, the BBC has again opted to avoid presenting audiences with the full picture. The report does not clarify that the postponement of the fourth tranche of prisoner releases came after little if any progress had been made throughout eight months of negotiations – with direct talks having not taken place for months – and against the backdrop of the Palestinian Authority’s refusal (with Arab League backing) to agree to security arrangements in the Jordan Rift Valley and its refusal (again with Arab League support) to announce an end to future claims – and thereby an end to the conflict – by recognizing Israel as the Jewish state. 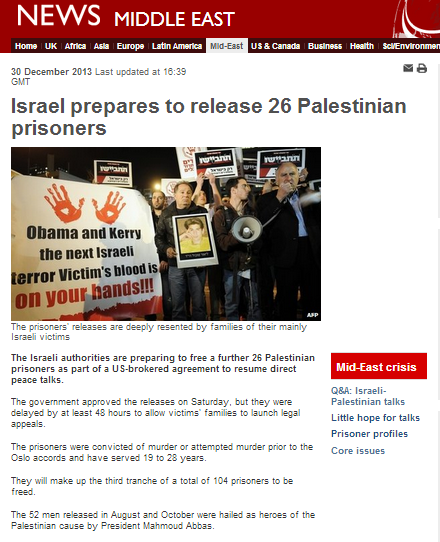 Although this report improves on previous ones by at least mentioning the potential inclusion of Arab-Israeli prisoners in the fourth tranche of prisoner releases, the BBC continues to avoid informing audiences of the fact that the inclusion of those particular prisoners had not been part of the agreement reached at the outset of the talks and that it was in fact a demand made by the Palestinian Authority. Once again, no effort is made to explain to readers the highly problematic aspects of this attempt by the PA to claim to represent citizens of another country and the clear interference in Israeli sovereignty that demand signifies. Neither is any effort made to explain to readers the potential political fallout for Israel’s coalition government which could be brought about by any release of Arab-Israeli prisoners. The BBC’s suggestion that Israel reneged on a release of “Israeli-Arab prisoners, as agreed in principle” is contradicted by its own report from July 30th 2013 in which it was clearly stated that the identities of the prisoners scheduled for release – to be decided by Israel under the terms of the agreement – had not been publicized. “Also on Sunday, the Israeli cabinet approved the release of 104 long-term Palestinian prisoners by 13 votes to seven. “Israel stressed that it had predicated any release on progress being made in the negotiations and on the Palestinians abiding by a commitment not to seek membership of international agencies. Like its predecessors on the same topic, this report fails at this point to mention the supplementary concessions offered by Israel as an incentive to continue the talks after the April 29th deadline – including the release of an additional 400 prisoners and a commitment not to release any new building tenders for Judea & Samaria. On Wednesday, Palestinian Authority President Mahmoud Abbas signed applications to join 15 international conventions which Palestinian officials said was a response to Israel’s failure to release the prisoners. Israel fears the Palestinians will use the treaties as a legal tool against it and to further enhance statehood which is subject to the negotiations. At this point the report should have clarified that the talks’ ‘pre-nup’ included a specific commitment by the PA not to make such applications to the UN (as recently confirmed by the PA president’s spokesman) and it should also have informed readers of the additional new demands presented by the Palestinian Authority as condition for the extension of talks – but no mention whatsoever of those new demands is made. Clearly, so much crucial information is being systematically left outside the BBC’s framing of this story that audiences cannot hope to develop a fact-based coherent understanding of this particular international issue. On the afternoon of April 3rd a report appeared on the Middle East page of the BBC News website under the title “Israel cancels Palestinian prisoner release“. The article underwent numerous changes until the appearance of its final version, as can be viewed here. Its presentation on the Middle East page included two links to ‘related stories’: one to the BBC’s July 2013 “History of Mid-East peace talks” and another to the outdated backgrounder titled “Q&A: Israeli-Palestinian talks in Jerusalem”. The article’s outstanding feature is its transparent attempt to promote to BBC audiences the notion of equivalence in both its wording and through the images used. The two photographs below are prominently featured in the body of the report. 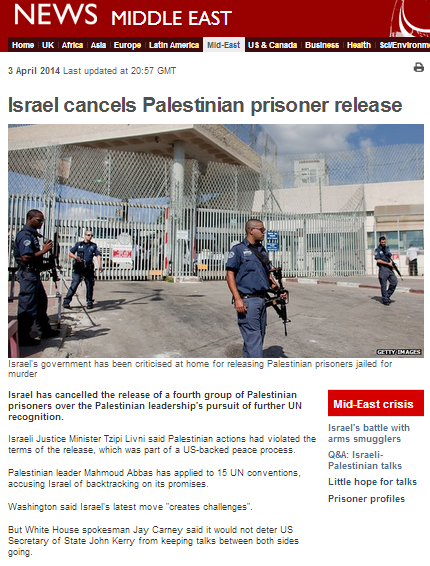 Once again – as was the case in the BBC’s previous two articles on the topic of the floundering talks – audiences are not informed that the Palestinian Authority’s stance concerning the fourth tranche of prisoner releases included the demand to free prisoners who are Israeli citizens and consequently they also remain unaware of the implications of that demand. “Israel has cancelled the release of a fourth group of Palestinian prisoners over the Palestinian leadership’s pursuit of further UN recognition. Although the BBC quotes Israel’s negotiator Tzipi Livni as saying that Mahmoud Abbas’ application to join assorted UN conventions “violated the terms of the release”, no attempt is made to properly clarify to audiences that in the run-up to the talks the PA specifically committed itself to refraining from just such a move for their nine-month duration which does not expire until April 29th. Neither is it made clear to audiences that the prisoner releases were subject to progress in the talks – of which there has been little – and recent statements by Palestinian officials concerning the prisoner releases are of course excluded from view. As was the case when a similar statement was made in a previous BBC report on the issue, audiences are not informed of the full extent of that proposed deal and Israeli concessions are downplayed. Israel would “exercise restraint” in releasing government tenders for new homes in the West Bank, meaning that it would issue no new government tenders for housing in Judea and Samaria. This policy would not include Jewish neighborhoods in Jerusalem beyond the Green Line. Significantly, the latest set of Palestinian demands for the continuation of negotiations –presented on April 2nd – is not mentioned at all in this BBC report. 1. A written commitment by Prime Minister Benjamin Netanyahu that the borders of the Palestinian state will be along the 1967 ‘green-line’ and that its capital will be East Jerusalem. 2. The release of 1,200 Palestinian prisoners, including political heavyweights Marwan Barghouti, Ahmed Saadat and Fuad Shubkhi. 3. An end to the Egyptian-Israeli blockade on Gaza, and the formulation of dealing allowing the flow of goods into Gaza. 4. A halt in construction in East Jerusalem. 6. Israel will permit the PA control over Area C – currently under Israel’s control. 7. The Palestinians known as the Church of Nativity deportees– a group of terrorist who barricaded themselves in the Church of the Nativity on April 2, 2002 and were later deported to European nations and the Gaza Strip – will be allowed to return to the West Bank. 8. The reopening of a number of Palestinian development agencies Israel shut down. Additionally, once again we see that in this report – as in its predecessors – the BBC neglects to explain to audiences the significance of the PA’s crucial refusal (backed by the Arab League) to recognize Israel as the Jewish state and hence bring an end to any future claims and an end to the conflict. The entire tone of this latest report on the subject of the talks can be summed up by looking at a statement by the BBC Jerusalem Bureau’s Kevin Connolly which appears in the body of the article and also in its side-box of ‘analysis’. In other words, equivalence is currently the name of the game for the BBC and the steering of audiences towards that view is achieved by selective presentation of information which includes downplaying Israeli offers of concessions and disappearing assorted Palestinian demands, as well as the continued presentation of a supposed moral equivalence between terrorist and victim. 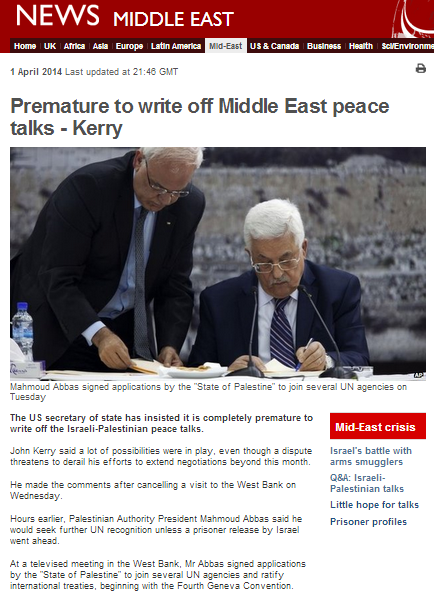 On the evening of April 1st an article titled “Premature to write off Middle East peace talks – Kerry” appeared on the Middle East page of the BBC News website. The event which prompted the appearance of that article – and its title – was the live televised signing by PA president Mahmoud Abbas of applications to join assorted UN agencies. “Hours earlier, Palestinian Authority President Mahmoud Abbas said he would seek further UN recognition unless a prisoner release by Israel went ahead. At a televised meeting in the West Bank, Mr Abbas signed applications by the “State of Palestine” to join several UN agencies and ratify international treaties, beginning with the Fourth Geneva Convention. However, at no point in the report does the BBC bother to inform readers that, as part of last July’s overtures to this latest round of negotiations, the Palestinian Authority committed itself to refraining from just such a move for the nine-month duration of the talks which does not expire until April 29th. That above BBC description of Abbas’ move is followed immediately by the following piece of information, which is totally irrelevant to the story’s subject matter given that no building freeze was agreed upon as a condition of the current negotiations. “Israel meanwhile reissued tenders for 708 homes in the Jewish settlement of Gilo in East Jerusalem, the Israeli pressure group Peace Now said. 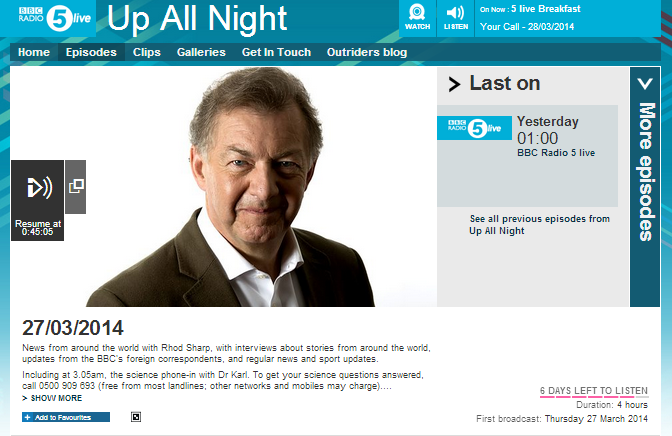 In what has become standard BBC practice, audiences are herded towards a mistaken belief that Israel is alone in disputing that particular interpretation of Article 49 of the Fourth Geneva Convention and – in breach of BBC editorial guidelines on impartiality – readers are not informed that any other dissenting opinions even exist, let alone of the basis for such disagreement. The statement that “Israel captured East Jerusalem from Jordan” in 1967 may be technically accurate, but it is also deliberately misleading because it does not inform readers of the relevant fact that Jordan’s 19-year occupation of parts of Jerusalem was not recognized by the international community. In keeping with its previous article on the subject of the rickety negotiations published earlier on the same day, the BBC again fails to make any mention in this report of the fact that the Palestinian Authority’s stance concerning the fourth tranche of prisoner releases includes the demand to free prisoners who are Israeli citizens. Hence, yet again, no explanation is provided to BBC audiences regarding the highly problematic aspects of that attempt by the PA to claim to represent citizens of another country and the clear interference in Israeli sovereignty that demand signifies. Neither is any attempt made to explain to readers the potential political fallout for Israel’s coalition government which could be brought about by any release of Arab-Israeli prisoners. “Mr Kerry has for weeks been trying to persuade both sides to continue the direct negotiations beyond 29 April, but his efforts have been jeopardised by a disagreement over the release of a fourth group of 26 long-term Palestinian prisoners from Israeli jails. Mr Abbas says they must be freed, in keeping with a promise made by Israel before the negotiations resumed in July after a three-year hiatus. But Israeli officials say they are reluctant to proceed unless the Palestinians commit to extending the talks, and stress that the releases have always been tied to their progress. “Earlier on Tuesday, the US Secretary of State held talks with Israeli Prime Minister Benjamin Netanyahu and chief Palestinian negotiator Saeb Erekat amid reports that they were close to finalising an agreement that would extend the talks until 2015. This report is the third to appear on the BBC News website in the past week in connection with the current talks between Israel and the PLO – see here and here. None of these articles have explained to audiences the significance of the PA’s refusal to recognize Israel as the Jewish state with regard to ending future claims – and therefore the conflict. Two of the three articles omit any mention of the Palestinian demand for the release of Israeli Arab prisoners and none of them explain the significance of that demand to audiences. In this latest report, Israeli offers of concessions are downplayed whilst an irrelevant passage about the re-issuing of building tenders in a Jerusalem neighbourhood is promoted. The fact that this latest PA attempt to join UN agencies breaches agreements reached ahead of the current talks is also disappeared from audience view and no attempt whatsoever is made to place this move within its appropriate context. If and when these negotiations do fizzle out, BBC audiences will be ill-placed to understand why that happened due to the BBC’s selective and systematic omission of crucial parts of the story in its reporting. 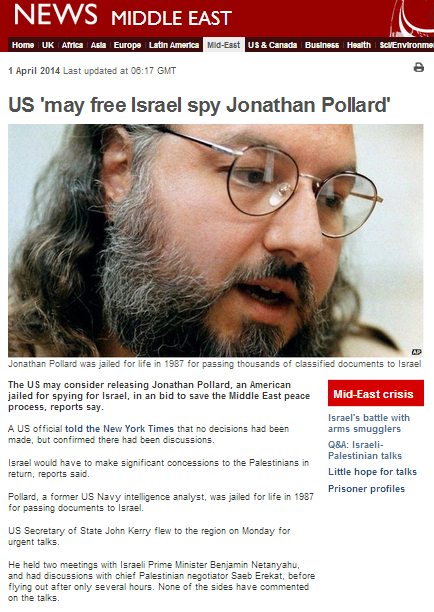 On April 1st an article titled “US ‘may free Israel spy Jonathan Pollard’” appeared on the Middle East page of the BBC News website. Notably, the previous BBC News website report on the subject of the current uncertainty surrounding the continuation of negotiations between Israel and the PLO appeared almost a week before, on March 26th. This latest article improves on its predecessor by noting that the four tranches of prisoner releases agreed to as a ‘goodwill gesture’ to encourage the Palestinian Authority to renew negotiations last July were from the outset tied to the progress of those talks. “It is the second time that Mr Kerry has interrupted his schedule to press Israel and the Palestinians to extend the direct peace talks beyond 29 April – the deadline set last summer when they resumed after a three-year hiatus. His plan has been derailed by a dispute over the release of a fourth batch of 26 long-term Palestinian prisoners from Israeli jails. Mr Abbas had insisted that they be freed by 29 March, in keeping with a promise made by Israel before the direct negotiations resumed. However, the report’s laconic description of the reasons for Israeli public opposition to the release of convicted terrorists does little to adequately clarify the topic to audiences. No attempt whatsoever is made in this report to inform audiences of the Palestinian Authority’s demand that Arab-Israeli prisoners be included in the fourth tranche of releases, with BBC audiences consequently remaining unaware of the highly problematic aspects of that attempt by the PA to claim to represent citizens of another country and the clear interference in Israeli sovereignty that demand signifies. Neither is any attempt made to explain to readers the potential political fallout for Israel’s coalition government which could be brought about by any release of Arab-Israeli prisoners. If BBC audiences are to fully understand the currently debatable future of talks between Israel and the PLO, they clearly need to be made aware of the entire story behind the delayed fourth prisoner release as well as other significant aspects of the story completely overlooked in this report such as the PA’s refusal (backed by the Arab League) to renounce future claims and bring about an end to the conflict by recognizing Israel as the Jewish state. Significantly, that particular – and much more crucial – topic has been completely ignored by the BBC in all of its reports on the current talks so far and, as we see in this article, even aspects of the story which are being reported are being framed in such a way as to present an incomplete picture. 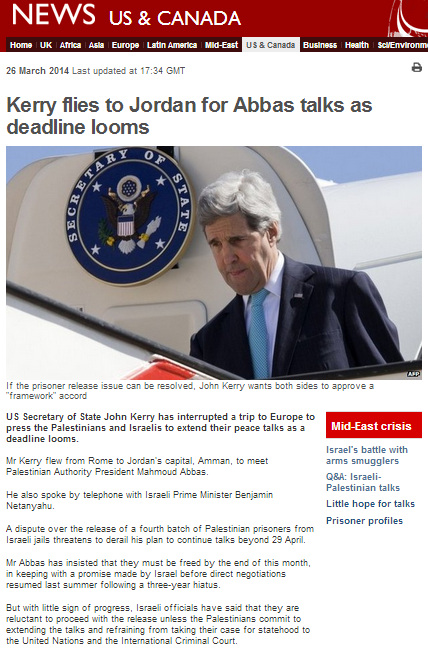 On March 26th an article titled “Kerry flies to Jordan for Abbas talks as deadline looms” appeared on the Middle East and US & Canada pages of the BBC News website. “A dispute over the release of a fourth batch of Palestinian prisoners from Israeli jails threatens to derail his [Kerry’s] plan to continue talks beyond 29 April. The BBC fails to inform readers that the prisoner releases were from the very beginning tied to the talks’ progress – of which there has been little to date – as explained by the Israeli prime minister to his electorate last July. “I believe that it is important for the State of Israel to enter a diplomatic process that will continue for at least nine months – in order to check if it is possible to reach an agreement with the Palestinians during this time. The BBC fails to inform audiences that the subject of which prisoners are to be released and when is decided by a committee of Israeli ministers – not by the Palestinian Authority. “The vote on the release of 104 Palestinian prisoners as a goodwill gesture ahead of renewed peace talks was delayed for several hours on Sunday morning as Netanyahu sought to secure enough support for the move, in the face of internal pressure from within his own Likud party. Of course no attempt is made by the BBC to point out to audiences the absurdity of the discordant assumption by the Palestinian Authority that it can demand the release of murderers who are citizens of the state in which they are imprisoned due to their having killed citizens of the same state. 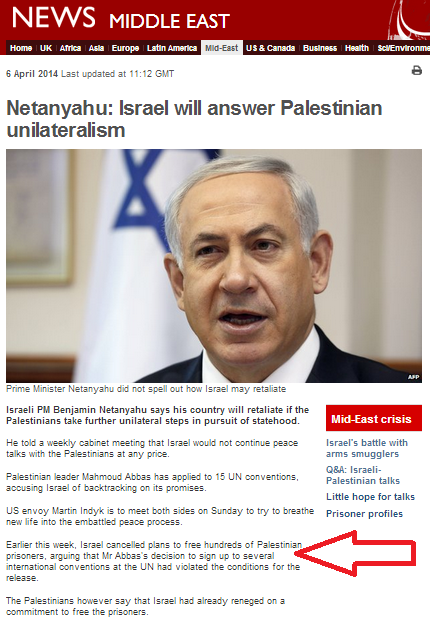 Neither does this article bother to inform readers with regard to the likelihood of the PA’s agreeing to extend the talks after April 29th: a point which is particularly relevant given that the PLO’s chief negotiator made it very clear during an interview with the BBC just last month that the chances of that are exceedingly slim. “Arab League leaders attending a summit in Kuwait on Tuesday expressed their “total rejection” of Israel’s call to be recognised as a Jewish state. Once again, no attempt whatsoever is made to inform BBC audiences of the significance of Israel’s demand that the PA recognize Israel as the Jewish state as far as ending any future claims – and therefore the conflict – is concerned. There is of course a distinct possibility that this round of talks will become unsustainable in the coming days or weeks. Whether the BBC will choose to ‘contextualise’ that through promotion of the notion that Israel did not meet its agreements regarding prisoner releases or whether it will be the demand for recognition of Israel as the Jewish state or some other Israeli action which will be blamed for the collapse is as yet unclear. What is obvious, however, is that the scene is already being set by means of articles such as this one which fail to provide audiences with accurate and comprehensive information and instead simply opt to amplify the narrative of the Palestinian Authority and its Arab League mentor. Why has the BBC stopped reporting on the Israel-PLO peace talks?